The savannahs of Tanzania are populated with vast herds of antelope, magnificent predators, and epic stories of survival, where the age old law of kill and be killed still prevails. You’ll be treated to definitive Africa, and get to enjoy some of its very finest game lodges. Discover the world-renowned Serengeti, Lake Manyara National Park and its ‘tree climbing’ lions, and Ngorongoro Crater, nicknamed ‘Africa’s Eden’ for its overwhelming physical beauty and abundance of wildlife. This nine day journey reveals the wonders of Tanzania every step of the way. Welcome to Kenya and its vibrant capital Nairobi. On arrival you’ll transfer to your hotel for your overnight stay. Visit the Giraffe Centre to hand-feed the endangered Rothschild giraffes, then enter the home of Karen Blixen, author of Out of Africa. Fly to Kilimanjaro for heavenly views of the mountain. Your first taste of Tanzania is from your lodge, your home for the next two nights. Immerse yourself in the beauty of the park, which is set at the base of the 600 metre high Rift Valley escarpment. Lake Manyara is home to over 400 bird species, as well as the ‘tree climbing’ lions the park is famous for. Visit a local community in Lake Manyara’s countryside where you’ll get to enjoy unique cultural activities and learn about Tanzanian culture. Journey to the Ngorongoro conservation area and enjoy a welcome lunch your lodge, your home for the next two nights. Later, enjoy a guided walk along the crater rim accompanied by experienced guides. Descend to the crater floor on your extended game drive in one of Africa’s most famous conservation areas. The overwhelming physical beauty of the area, along with the abundance of wildlife, is sure to make this a very special day. Step back in time this morning with a visit to Olduvai Gorge, site of major archaeological findings, including traces of pre-historic man which date back 3.5 million years. Later, enter the Serengeti National Park with its vast central plains, made fertile by the ashes of the nearby highlands. Check into your authentic safari camp for the next three nights. The Seronera Valley is renowned for its year-round game viewing due to its abundance of water, as well as its large population of resident cats. Enjoy morning and evening game drives in your specially adapted safari Land Cruiser. Experience the savannah at dawn from a hot air balloon - additional expense, please book on tour. Today, you’ll also have the chance for more big game encounters on morning and evening game drives. Enjoy a celebratory toast at Mukoma Hills, with magnificent sunset views. 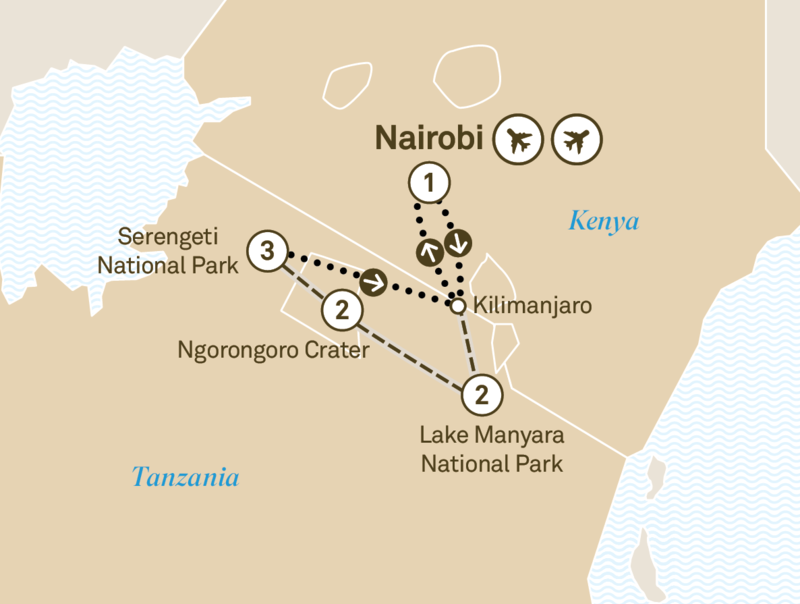 View the Serengeti from the air en route to Nairobi for your homebound flight. Please book flights to depart after 7.30pm from Nairobi. Tanzania is an independent tour, not escorted by a Scenic Tour Director.